Remember how I said that chocolate milk is the perfect post-workout recovery drink? The New York Times recently reported about a new study showing even more health benefits derived from regular consumption of chocolate milk. The study found that "skim milk with flavonoid-rich cocoa may reduce inflammation, potentially slowing or preventing development of atherosclerosis." “Since atherosclerosis is a low-grade inflammatory disease of the arteries, regular cocoa intake seems to prevent or reduce” it, said Dr. Ramón Estruch of the University of Barcelona, the paper’s senior author, adding that more studies were needed. Participants also had significantly higher levels of good HDL cholesterol after completing the chocolate milk regimen, according to the study, which appears in the November issue of The American Journal of Clinical Nutrition and is already online. 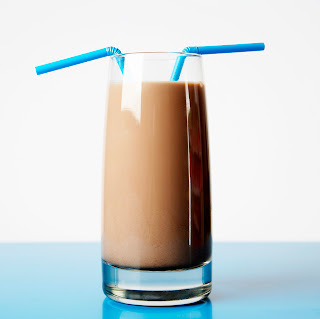 Seriously, folks -- it's time to ditch Beachbody's overpriced P90X Recovery Drink in favor of cheap, tasty chocolate milk.